Shrubs or subshrubs, 40-100 cm. Leaves opposite; petioles (0-)3-6 mm; blades elliptic-oblong to lance-elliptic, 3-8 cm, margins serrate or entire. Heads in ± congested, compact clusters. Peduncles 0 or 1-2 mm, hir-sutulous. Involucres 5-6 mm. Phyllaries densely stipitate-glandular and sparsely villous to hispid, apices acute. Corollas white, lobes hispidulous. Pappi coroniform (scales shorter than corollas). Flowering (Feb-)Apr-May(-Sep). Rocky slopes, road cuts, streamsides, oak-juniper, pine-oak, and cottonwood-sycamore woodlands; 900-1700 m; Ariz.; Mexico (Chihuahua, Sinaloa, Sonora). 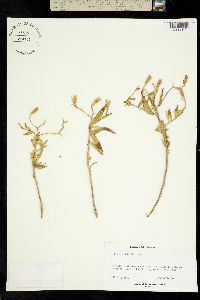 Stevia hispidula (Grashoff) B. L. Turner, based on S. lemmonii var. hispidula Grashoff, is illegitimate; it is a later homonym of S. hispidula de Candolle.